Cape Town - The fastest man in history over 400m, injured playing a meaningless game of tag rugby and putting his career in jeopardy ... it is almost unbelievable. 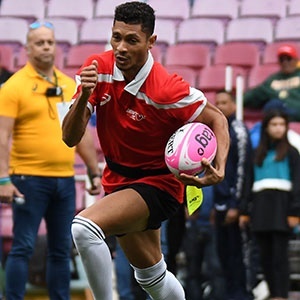 But those who were at Newlands on October 7 and saw South Africa's golden boy, Wayde van Niekerk, limp off the field had their suspicions that something was seriously wrong. On Tuesday, those fears were confirmed when Van Niekerk revealed that he had torn his ACL and meniscus as a result of the freak injury. He will now miss the 2018 Commonwealth Games. As fans streamed into Newlands to find their seats ahead of the main event that day between the Springboks and All Blacks, Gallo Images were hard at work shooting what would become the most important "unimportant" game of rugby that South Africa has ever seen. These are pictures from the day, with photographers Grant Pitcher and Wessel Oosthuizen snapping the sequence of events. Problems ... the champ can feel that something is not right.